Avingard agreed and left Legate Rikke and General Tullius to their planning. He exited the castle and walked back through the streets of the city that he had walked previously. As he walked along he noticed a blacksmith up on an elevated walkway to his right. He walked up some stairs and approached the blacksmith. The blacksmith, a large Nord man, was busy at his grinding wheel and didn’t notice Avingard approach. Not wanting to disturb the man, Avingard knelt beside the tanning rack. His father had taught him how to make a few items, including a few winter clothing. Looking over his inventory, Avingard noticed that he had a four wolf pelts and about eight leather strips. 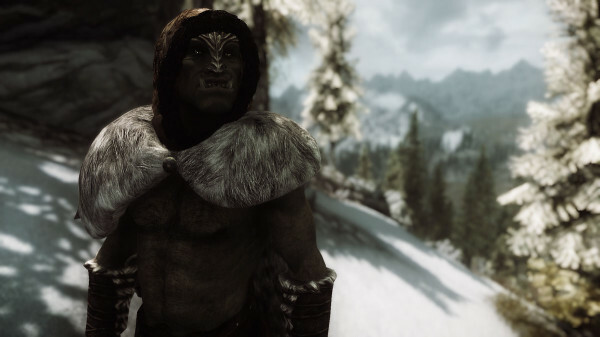 Using all four pelts and three of the leather strips, Avingard made himself a wolf skin cloak that would fit over his armor, and protect him from the cold weather. Being satisfied with his creation, Avingard left rose to his feet and walked back down the stairs and continued down the street. He exited Solitude through the main gate and back along the road he had taken when he arrived at the city. Avingard stopped briefly to look over his map. He noticed that Fort Hraggstad was north west of Solitude, and was linked by a small road to another road that ran east and west. To get to that road Avingard would need to follow the current road towards Dragon Bridge, but then turn northwest at the last fork before Dragon Bridge. This was the same fork that ascended up into the cliffs overlooking the road he was currently travelling. He put away the map and continued along the road. The travel along the road was uneventful, and he soon reached the fork he needed to take that will lead to the east-west road to Fort Hraggstad. Avingard ascended the cliffs along the road, and the higher he climbed the more snow covered the ground. When he finally reached the top he noticed a large orc, wearing winter clothing, standing beside two dead sabre cats. As Avingard approached the orc just look at Avingard, although Avingard didn’t feel threatened. The orc looked as if he had lived a long and eventful life, which also meant he looked like he could handle his sword well in combat. The two dead sabre cats lying at the side of the road were probably a testament to that idea. Avingard nodded his head as he passed the Orc, who returned the nod, and then continued on to the road. The path to the road was covered in snow, which made it difficult for Avingard to find his way, but eventually he came across a stone road. By this time a wind coming from the north had began to blow snow across the path, making it a little difficult for Avingard to follow as he raised his hand to shield his face. After a few minutes of traveling Avingard noticed a small road forking off to the north. Looking ahead of this new road Avingard could see a fort in the distance, which he knew was Fort Hraggstad. He carefully traveled a short distance along the road until he was close enough to spot an archer above the large main gate entrance to the fort. 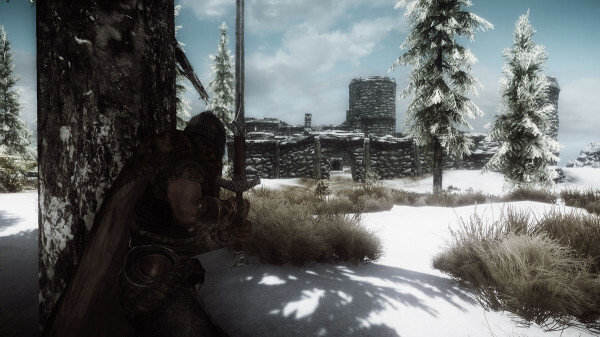 Avingard paused briefly to determine if the archer had seen him, and seeing the archer still pacing back and forth on the fort’s wall indicated to Avingard that he wasn’t spotted. Avingard quickly moved behind a tree that also provided him with a good view of the fort. He readied his sword and then looked over the fort. From his location Avingard could see only the single archer on the front wall of the fort. There were four towers in total – two in the front and two at the rear of the fort. The two front towers were on the opposite corners, while a third tower was position in the left rear corner. A large main tower could be seen near the middle of the rear, which probably also contained the entrance to the inner part of the fort. Unfortunately, from his distance Avingard couldn’t make out if any other archer were positioned on the rear towers, but he could not see any on the closest two towers. At the moment, only the lone archer was still all that Avingard could see. Avingard formulated his attack strategy: he would rush to the wall of the fort to prevent the archer from attacking him from a distance. Avingard hoped that if he hugged the wall it would make it impossible for the archer to fire down on Avingard from such an angle. If this part of his planned worked, he would then draw out any bandits that were milling about on the outer grounds of the fort, and then dispatch them one-by-one. the one main flaw that Avingard say in his plan was the fact that he could be surrounded if to many bandits rushed from the fort as he would have his back against the fort’s wall with no escape. Knowing the consequences, he came out from behind the tree and rushed the fort.